Debbie was born and raised 50 miles northwest of Florence in Savannah, TN. Her college choice was easy, as she enrolled at UNA in 1978. While at UNA, she was involved in numerous activities, including serving as a SOAR Counselor, joining a sorority, serving as a Resident Assistant, being elected by the student body as Miss UNA, and being chosen for the Hall of Fame prior to her graduation in 1982. Her desire to work on a college campus led her to get a master’s degree at Auburn University in Administration of Higher Education, and later her doctorate in the same program. Her first professional job was at Auburn University in Admissions. She spent 20 years working in Student Affairs, and the next 14 in Alumni Affairs. Debbie has been active in CASE and served as President of the SEC Alumni Directors Council. After 33 years of serving Auburn in various positions, she retired as a Vice President in early 2015, being awarded Emeritus status. After 14 months, the opportunity of a lifetime became available to her to serve her alma mater as the Vice President of Advancement, and she did not hesitate to return to the Shoals area. She has been working for UNA since May 1, 2016. Amy Bishop is a graduate of the University of North Alabama with a Bachelor of Science in Photography and a Master of Professional Studies in Higher Education Administration. She has over 15 years of experience in the photography and administrative field. She has 4 years of experience working with Alumni Relations and Advancement and enjoys the wide variety of tasks she gets to perform. Amy is married to Daniel Bishop, a 2006 and 2014 graduate, and lives in Rogersville with their daughter Della and miniature schnauzer Bernadette. With over 10 years of experience in fundraising, Barbie Terry has helped secure annual and multimillion dollar commitments from alumni and friends. Her dedication to philanthropy has helped garner critical funding for the programs and missions of the universities where she has worked. Barbie holds a Bachelor of Arts and a Master of Public Policy and Administration from Mississippi State University, where she also served as director of annual giving before coming to UNA. She’s married to Adam Terry of Town Creek, and the couple have two children – Eli and Avery. In her spare time, she enjoys attending sporting events with her family. Gwen Patrick is a 1983 graduate of the University of North Alabama with an Accounting degree. She is very proud to have performed with the Pride of Dixie Band as a Lionette for four years. Gwen obtained her Certified Public Accountant designation in 1986 and has worked in public accounting and as an financial adviser in the Shoals area. In January 2017, Gwen joined the Advancement Staff in an "opportunity of a lifetime to give back to the University that have given me so much". She is married to Jerry, a lineman with the City of Florence, and has two children, Kevin and Lesley (Tyler) Johnson. Mallory was born and raised 40 miles north of Atlanta, Georgia. She graduated from the University of West Georgia in 2009 with a B.S. Degree in Accounting. Mallory has experience in the Banking industry, as well as the Film Studio Industry where she was a Senior Accountant at Pinewood Atlanta Studios. She has lived in the area since June of 2016 when her husband, Zach Taylor of Phil Campbell, was named Plant Manager of Southwire in Florence. Mallory is the mother of a little girl named Camryn Taylor and two large dogs named Lucy and Judd. In her spare time, she enjoys traveling, reading, and spending time with family and friends. Mary Ramey is a graduate of Keller Graduate School of Management with a Masters in Financial Management. She has worked in higher education for over 14 years in Advancement and Accounting. She loves her dogs and has one adult daughter living with her in Tuscumbia. Amanda is a proud graduate of the University of North Alabama with a BBA in Human Resource Management in 2003 and she will receive her Master of Professional Studies in Higher Education Administration this December. 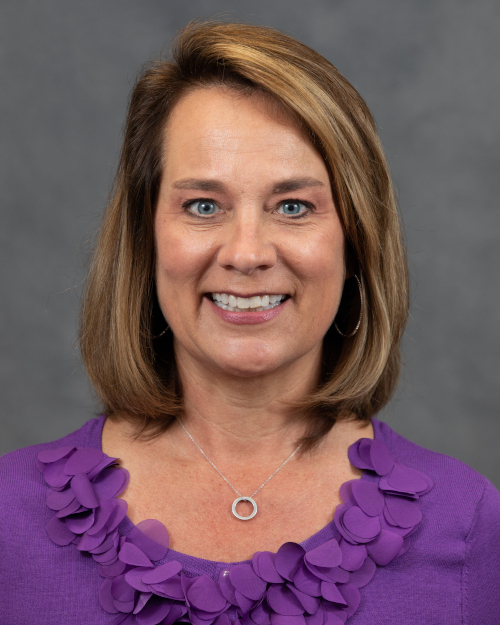 She has been employed at UNA since 2015 and served as the Grant and Scholarship Specialist in Student Financial Services prior to joining the Advancement team. Amanda is married to David Sherrod and the mother of two children, Amber Grace and Gavin. In her spare time, Amanda enjoys reading, cooking, and spending time with her family. 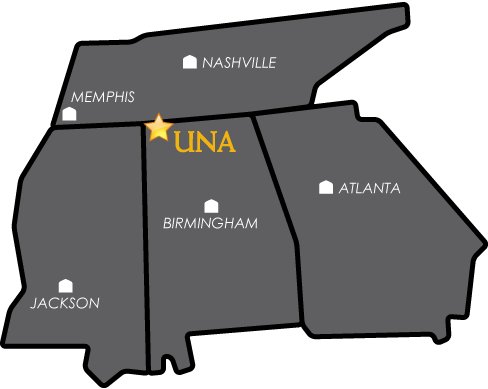 Erin is a proud alumna of the University of North Alabama, enthusiastic supporter of the community and seasoned marketing and communications professional. Born in Niles, Michigan and later moving to Tennessee, she came to Florence to pursue a degree in Marketing from UNA. While at UNA, she was a member of Phi Beta Lambda, pledged a sorority and received a B. S. Degree in Marketing. Most recently, she received a Master’s Degree in Professional Studies in Community Development, and was invited to join Phi Beta Kappa. Serving a local, community bank for over 17 years, Erin joins UNA and the Office of Advancement with extensive experience in community engagement, volunteer coordination, and fundraising involvement. Erin resides in the Shoals with her husband, Joel, and son, Kayden-Reed. Her interests include traveling, reading and volunteering with philanthropic efforts. Jocelyn Barnes is 2018 graduate of the University of North Alabama with a Bachelor of Arts in Communication Studies. During her time at UNA, Jocelyn was proud to have been a part of various organizations. She was selected as a Promising Alumni, and Undergraduate Service Award recipient in 2017. Jocelyn particularly cared for her time as the 2016 Head SOAR Counselor, Miss UNA 2016, and her two years as a LaGrange Society Ambassador. She joined the Advancement staff in June 2018, and is extremely excited to get to work with this incredible staff and UNA alumni. In her spare time, Jocelyn enjoys eating, traveling, and preparing for graduate school. Morgan Nixon is a native to the Shoals area and a graduate of the University of North Alabama with a Bachelor of Science in Public Communication. She joined the Advancement team in July 2018 with five years’ experience in the administrative field. She is excited to be back on campus and part of the UNA family. Her interests include photography, lettering, and various crafts. In her spare time, she enjoys attending social events and spending time with friends and family. Laura Hamner comes to UNA with over 25 years of experience in marketing, sales, banking, database management and analysis, event planning, and fundraising. Originally from Connecticut, she has lived in the state of Alabama ever since her graduation from Miami University (Ohio) in 1990. Laura called Birmingham and Huntsville home for a number of years before returning to her husband’s hometown in the Shoals in 2007. She has been an active member of the Shoals community for over 11 years; doing volunteer work for various charities and organizations, as well as school PTO’s in the area. Laura is married to Joel, has two daughters; Madeleine and Lauren, and a chocolate lab, Max. When she is not working, Laura enjoys reading, traveling, attending sporting events, and spending time with her family. Bishop Alexander of Florence, Alabama is a proud graduate of the University of North Alabama with a Bachelor of Science Degree in History, Political Science and Government in 2009 and Master of Science in Criminal Justice in 2012. While attending UNA, he was SGA President, Promising Alumni recipient, Homecoming King, SOAR Counselor, LaGrange Society Ambassador, and member of Fraternity/Sorority Life. 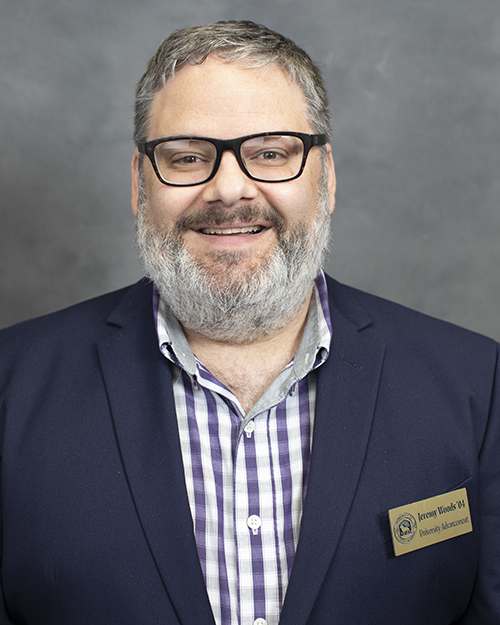 He has volunteered and served on the UNA Alumni Association Board-At Large Directors for 5 years before becoming the Director of Alumni Relations in November 2018. In his spare time, Bishop serves on advisory boards, volunteers in the community, mentors college students, and a frequent public speaker in high schools, colleges, and leadership development conferences. A first generation college graduate, Bishop sees the value of education as an opportunity to start a new chapter and learn valuable life and leadership skills that will help people from all walks of life for the road ahead. Sherry is a proud 2015 graduate of the University of North Alabama with a Bachelor of Social Work. She was born and raised in Warrenton, Virginia before moving to the Shoals area in 2006. Sherry considers Social Work her life’s work as she enjoys working with people. She has served as a substitute teacher since 2003 as well as a Foster care and adoption class speaker and trainer. Sherry is married to Michael and has three children; Maurice, Danielle (’12), and Trey. She has fostered many children and adults throughout the years, and is currently raising her niece Ma’leyah and nephews Ar’Monie and Ny’Colai. Sherry enjoys singing, music, needlework, and spending time with her family and friends. 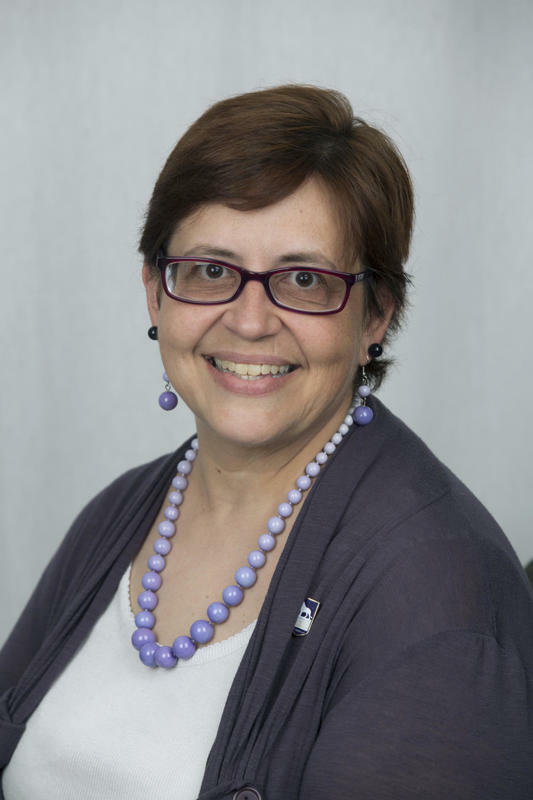 Karen Hodges is in her 27th year as part of the creative team at the University of North Alabama and currently serves as Associate Director of Creative Services; she also served as Publications Assistant and University Photographer during her time at UNA. She is an award-winning graphic designer, including 25 “Best in the Nation” awards for her work with UNA’s athletics publications. Karen is a 1982 graduate of UNA with a B.S. degree in Art. She is married to Jeff Hodges, a 1982 UNA graduate, who serves UNA as assistant athletic director for communication and they have worked a combined 59 years at UNA. Karen is a mother of three, with a son Dillon (24) and daughters Shanna (19) and Melanie (17). Dillon is a 2012 UNA graduate and received a Promising Alumni Award. Cindy Brusseau-Hollander has worked in Administration and Management for over 20 years. Jeremy Woods is a 2004 graduate of the University of North Alabama with a Bachelor of Business Administration in Computer Information Systems. He wrote his first code on a Commodore 64 computer as a child. Jeremy’s proudest professional achievement is code he wrote to automate budget decisions for TVA and their Department of Defense projects. This contributed to the demolition of many DoD former chemical weapon production facilities. He has been an entrepreneur and developed websites for many businesses in the Shoals area and across the country. When he is not working, Jeremy enjoys reading, cooking and playing trombone. Kali Daniel is an award-winning writer and designer concentrating on, but not limited to, print publications. She has been designated the Southeast Journalism Conference's No. 1 page layout designer and No. 2 news graphic designer, and the College Media Association's Pinnacle award recipient for college newspaper nameplate. Kali is a 2016 graduate of UNA with a Bachelor of Arts in Mass Communications, concentrating in Print/Online Journalism, and a double-minor in Women's Studies and International Studies. She is the mother of one adorable smooth collie mix, Salazar. When she's not designing for the university, you can usually find her designing in her free time also. Matt Treiber is a current student pursuing a degree in Cybersecurity Information and Assurance. He has worked as a front-end web developer for five years. In his free time, he enjoys cars, video games, music, and spending time with his wife, April, his parents, and the family cats.